Can it get worse than buffel? Yes, it can: A weed that is possibly a “sleeper” right now could take over the pastoral lands in The Centre. And that weed – one of the African love grasses – cattle cannot eat, spelling the end of our livestock industry, as occurred over tracts of grazing country in the USA in recent times when several inedible species took over. This scenario was described by renowned botanist Peter Latz in an address to the Rotary Club of Stuart last night. He said sleepers are frightening: They may be introduced plants, even decorative ones, growing in small numbers for decades, slowly adapting to the local conditions by putting themselves through genetic changes. 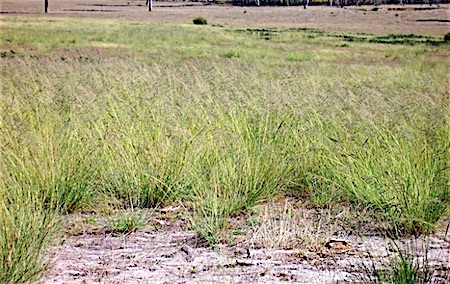 A few specimens of love grass (similar to the one at left) were growing for maybe a quarter of a century in a citrus orchard of the Arid Zone Research Institute in Alice Springs, being watered by government scientists, unwittingly creating a potential catastrophe. It is now growing along the Stuart Highway between Elliott and Port Augusta. In that scenario buffel, against which the love grass would need to compete, “may become my friend,” says Mr Latz, “as the enemy of my enemy”. But encouraging a buffel monoculture would be a huge price to pay: Much better to help native grasses come back, and foster all-important bio-diversity. Mr Latz (at right) says that’s not Mission Impossible: Although buffel has taken over vast expanses of The Centre’s best soils, it can be driven into retreat by killing it in selected pockets, encouraging native plants to come back. Those pockets could include the famous beauty spots in the West Macs, such as Ellery Big Hole, Simpsons Gap and Ormiston Gorge – the bedrock of our tourist industry. They would then form seed banks, ready to spread and regain their traditional habitat as buffel enters its decline. And that decline is inevitable, says Mr Latz, although it could take decades. He has studied the plant, declared a noxious weed in South Australia, for 60 years since it was introduced by the CSRIO and pastoralists, and was allowed to proliferate. Mr Latz has lately become aware of native plants growing in between clumps of buffel in the Simpsons Gap area of the West MacDonnells national park. He says when a species does extremely well it becomes vulnerable to attack by fungi and insects – as has already occurred in Queensland. This is when natives need to be ready to pounce – and that’s where human intervention can make a big difference, and the new government should take an urgent look at this. 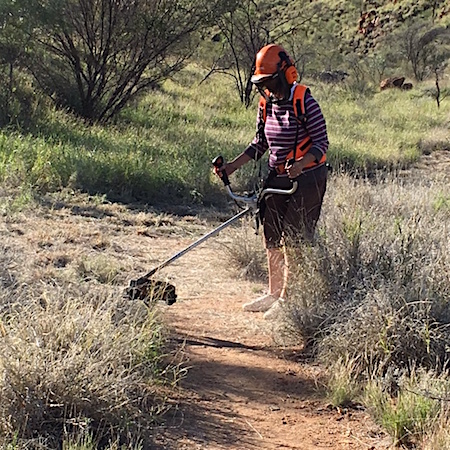 Members of the Rotary Club of Stuart are leading by example (photo at top), removing buffel from the area around the Wallaby Gap rest point on the Larapinta Trail. Volunteer workers told Mr Latz last night that they are already observing the return of native vegetation, and the increase of birdlife, attracted by the greater diversity of seeds. Mr Latz himself has cleared buffel from his 10 hectare block at Ilparpa, being rewarded with a return of some 40 native plant species, on land that had previously been “flogged” by cattle and other erosion. Flocks of birds are now a common sight. He says he has achieved this with “an aggregate of three man years of work over 10 years”. He is now extending this seed bank project to neighbouring blocks with the help of their owners. Other ‘buffel-busters’, scattered across the town, working on their own properties and some pockets of public land, are also active. Is there a connection between the proliferation of dingoes and wild dogs north-east of Alice Springs, and buffel? Mr Latz says there is a plausible scenario. As fodder for cattle, buffel is useful so long as it makes up only part of their diet. But if it takes over grazing land, as it is prone to do because it grows fast and burns hot, destroying native species, cattle would suffer ill effects from oxalic acid contained in buffel. Calves are more likely to die in the womb. Dogs move in, feasting on the carcasses. Cattlemen assume the dogs have killed the calves, but in fact they were stillborn. Another gem from legendary astute observer of arid lands ecology Peter Latz, suggesting that buffel, stillborn calves, and dingo numbers may be linked. This is the way to get buffel control on the agenda; by getting it off the agenda of the cattle industry. I have had much the same experience and detest the buffel. I noticed that on my block (Heffernan Road) the wind born seeds were accumulating at the bases of the witchetty bushes so I concentrated on removing that seed bank with Roundup. The rest was much easier, and now I spot spray an occasional plant here and there, and have started on the road verges. Now after a few years I can’t see the main road for the witchetty, which could not compete with the buffel when its seed germinate. What I would like to see now is a concentrated effort from government to upgrade some of our local acacia and other species to replace the buffel as a supposed grazing species. Unfortunately much of this local species improvement work is being done overseas for the benefit of them, not us. Just another example of very short term and short sighted political thinking. There are so many things like that with other local crops that would be of enormous environmental and economic benefit to this district. Now we have the Tanami apple being developed interstate for its medicinal properties with the results and royalties probably licensed commercially to the investigators, and spinifex used to re enforce condoms for the same reason. But then I just saw a pink camel fly by my front window.